Did you know that your brain uses about 20% of your daily energy intake, even though it only makes up two percent of your body weight? This week is Brain Awareness Week, a week set aside to inform people around the world about brain health and the importance of brain research. To celebrate this week, we have a few ideas to help boost brain health with one of Shiloh Farms’ super foods: Chia Seeds! Chia Seeds are an excellent source of brain-boosting omega-3 fatty acids. These are the essential fats needed for the formation of cell membranes in the brain and for the transmission of information between brain cells. They are also extremely beneficial in keeping a healthy heart. Chia Seeds are a great source of fiber, high in antioxidants, and are considered a “complete protein,” meaning they contain all essential amino acids. Some studies even suggest chia seeds help stabilize blood sugar by slowing the body’s digestions of carbohydrates. The food you consume every day is believed to influence the structure and function of the brain. For example, omega-3s help maintain neurons, while sugar and saturated fat filled foods damage cell membranes. 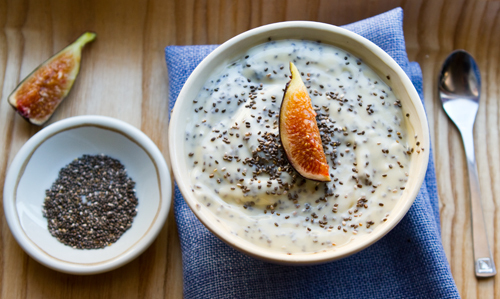 Sprinkle chia seeds on yogurt or cereal for breakfast. Make chia gel: Add 8 to 10 parts water to 1 part chia. Mix chia seeds in water while stirring rapidly. Let the mix stand for 5 minutes and mix again. Allow to set for about 15 minutes before using. Keep refrigerated for up to 2 weeks. Use chia gel to replace one half of the oil in baked goods, such as muffins and pancakes. Spread chia gel on top of your homemade bread before you bake it to help keep the bread fresh longer. The seeds will dry out and toast, resembling sesame seeds on the crust of the bread. Replace up to half of the water in yeast breads with chia gel. Mix chia gel into drinks, mayonnaise, sauces and jams. Add chia seeds to salads, smoothies and cereals. Make sure that you drink 12 oz. of water for every tablespoon of chia seeds that you consume. Chia seeds can absorb the liquid from your body and dehydrate you. For more great recipes that will help you incorporate this super food into your diet, we recommend taking a look at The Family Kitchen‘s tips on how to use Chia Seeds.